2018 Board Members at the AGM included from left Imbert Allen, John Bignell, Bridget Adams and Harry Ward. 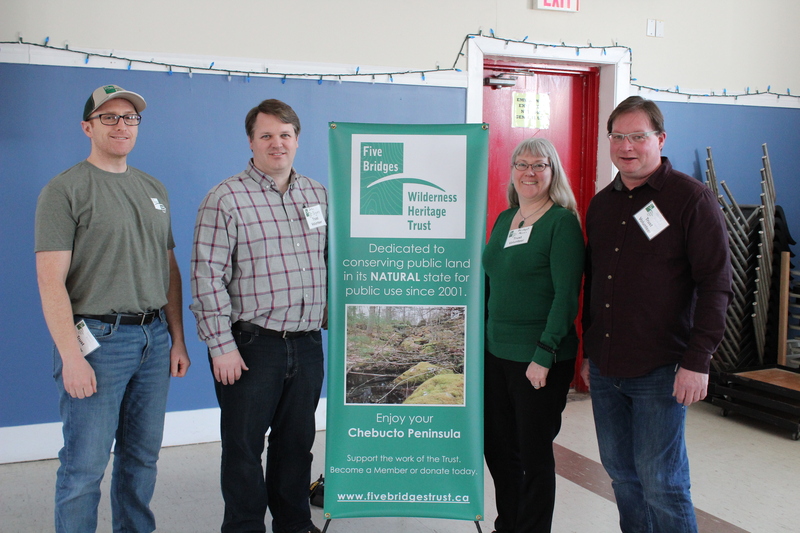 Trust supporters, friends and community members came together on Sunday, March 18th at the Estabrooks Community Hall in Lewis Lake to celebrate another successful year of activity for the Trust and its community. More than 30 gathered to hear the business report including the milestone projects of the past year such as the release of the second edition of the Walking Guide, the launch of the new Grants Program and the completion and installation of the new Nine Mile River Bridge. 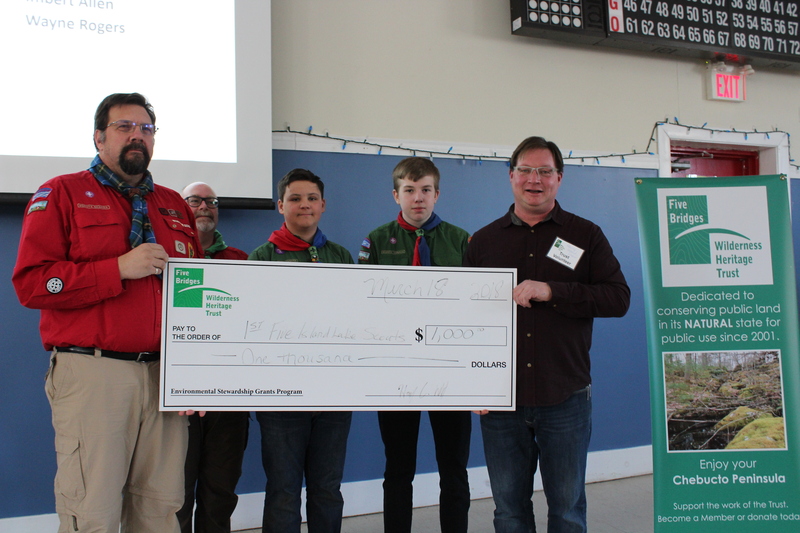 Jeff Parks accepts a $1000 donation from Harry Ward for the Scout group he leads. Two new Board Members were welcomed to serve as Trustees for the next three years: Imbert Allen and Wayne Rogers. There was also a chance to say thanks to volunteers like Jeff Parks who accepted an honourarium donation for his Scouts group in recognition for his design and mapping work on the Walking Guide. Gary Armsworthy was recognized for his long-time dedication as legal Advisor to the Trust. 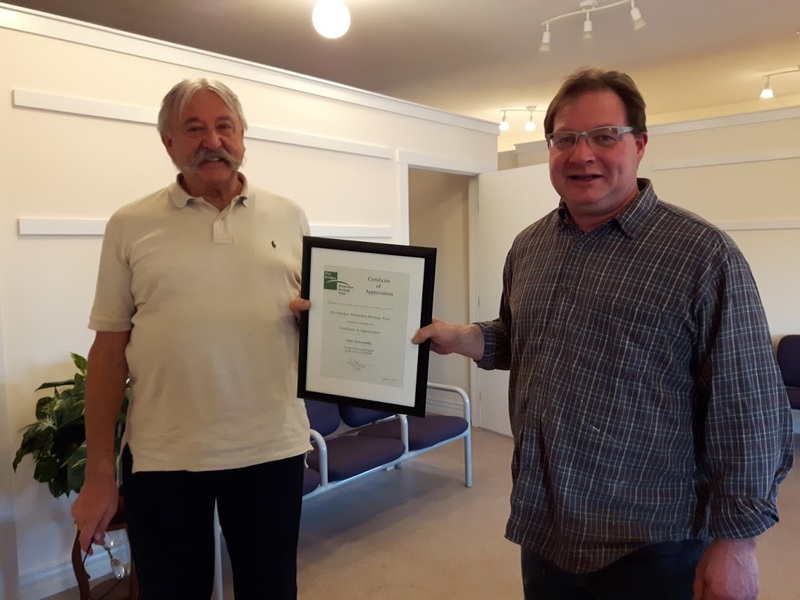 Gary Armsworthy, the Trust’s long-time legal Advisor was also recognized with a certificate of appreciation at the Trust Board Meeting the following Tuesday evening. Special Speaker Butch Galvez shows the audience a coyote fur. The Trust traditionally invites a special guest speaker to the AGM, which is always a wonderful addition to the event. This year, Butch Galvez, wildlife officer from Dept. of Natural Resources, gave an informative presentation about the eastern coyotes in Nova Scotia which really made the afternoon enjoyable. There was a lot of interest in this subject, and many questions came up about protecting smaller animals like cats and dogs around coyotes, and what to do should one be sighted on a hike. 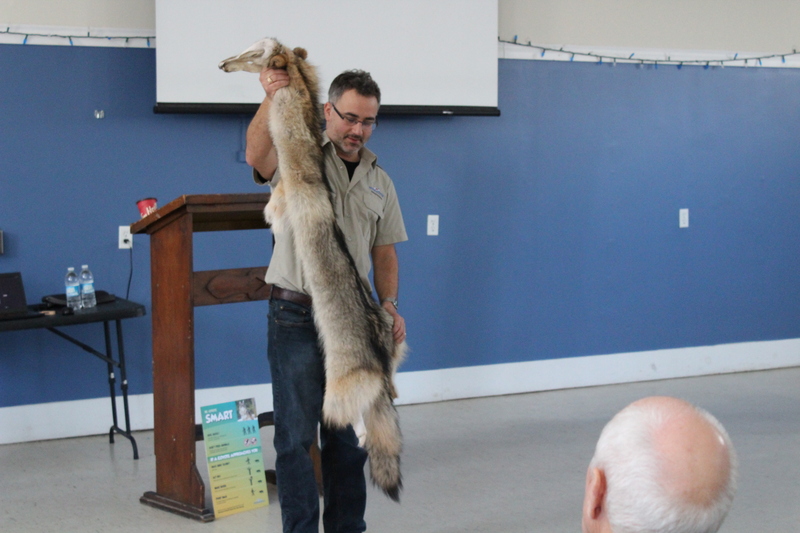 He provided handouts with tips and showed a coyote fur as part of his talk. You can see the slides from his presentation here. 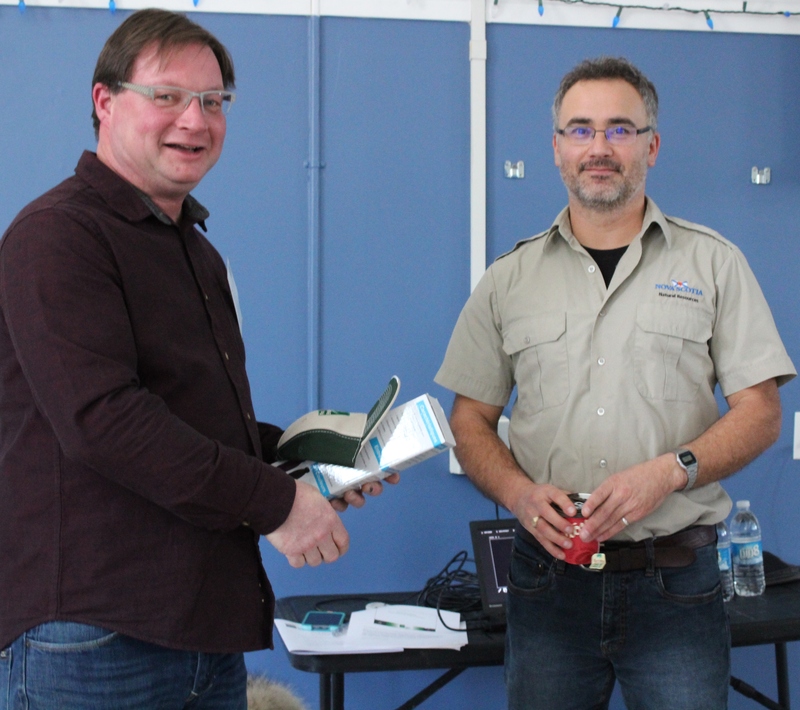 Trust Chair Harry Ward presents special guest speaker Butch Galvez with thank you gifts for attending the AGM. Some happy guests walked away with new Trust swag promotional items, drawn as door prizes. Jackets, hats, water bottles and t-shirts branded with the Trust logo will also soon be available on the website for order and purchase. This is another way the community can support the work of the Trust and help increase awareness of the Trust and the work it does. New annual memberships were also sold to those in attendance. 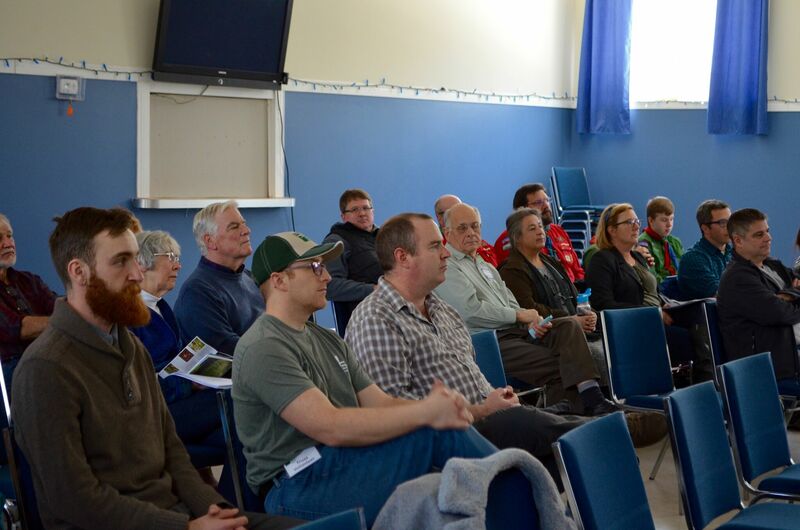 Guests at the 2018 AGM.